One thing we love to celebrate at ASTRO Gaming is how diverse the gaming community is: whether you’re a god at CoD, constantly scanning Steam for the latest indie games, or rolling a save in Dungeons & Dragons. What we all have in common is the passion for gaming. It is what binds us, and we love to share it with the ASTRO family. Sometimes, that passion for gaming comes through countless hours playing with your squad at PUBG, and sometimes it comes through countless hours paying homage to your favorite D&D character. As common as cosplay is nowadays at events like PAX East, it’s always nice to stop and smell the roses, so to speak. 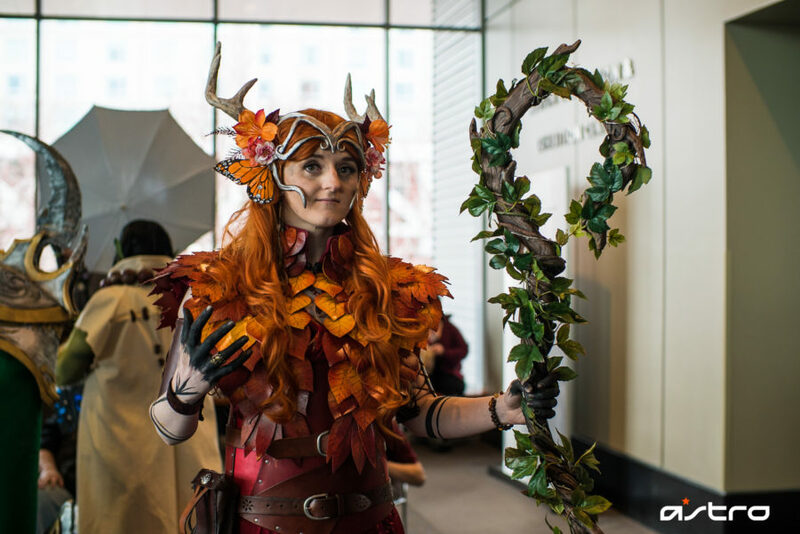 We are always blown away at the dedication, skill, and passion needed to make something IRL from a video game, like this Keyleth cosplay by Natalie Fuinha we found today on the show floor in Boston. The hand-made circlet on her head looks awesome (and like it took a lot of hours! ), and the details on her staff make it look like an illustration come to life. Not only are the hand-made elements impressive: the attention to detail elsewhere was awesome. Just check out the black paint on her hands and forearms. Not sure how many folks reading this know, but working with black paint on your hands is tricky enough without getting it everywhere you don’t want it. Natalie’s attention to the particulars like the branding Keyleth has is what made this stand out to us. We wanted to shout out Natalie and her hard work: it clearly paid off. You look awesome, lady! Thanks for checking out the blog, everyone! GG!